In June, we installed shelving in the George Turner Rare Book Room, located in the completed portion of our new library space. During APS Volunteer Work Week in July, APS members moved our rare book collection from its location in my office to the rare book room. The new room offers the collection much needed protection and room to grow that it did not have in my office, as well as more appropriate and adjustable shelving. 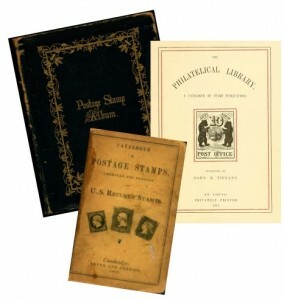 The APRL rare books collection includes examples of early philatelic literature, such as an 1863 postage stamp album published by Appleton, a stamp catalog also published in 1863, and John K. Tiffany’s The Philatelical Library. It also includes newer publications printed in very limited quantities. 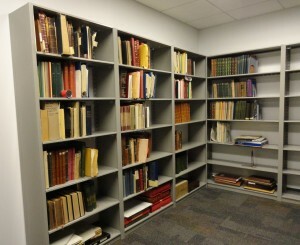 Other collections already housed in the completed portion of the new space include archives, auction catalogs, and price lists in the compact shelving and maps and other large documents in the Al and Dottie Kugel Map Room.